Our review model delivered a straight neck, low action and minimal tension... all of which make the FRX-401 an incredibly easy instrument to pick up. That is, of course, once you've figured out how you're going to put it down. If there's anything that LTD's FRX range screams from the rooftops, it's: 'I am the devil and I am here to do the devil's work'. With more points than a NewsnightElection Special and more curves than a Nicki Minaj video, the 401 is certainly eye-catching - in fact, look too close and it will take your eye out. Frustratingly, however, it's this unique selling point that ends up being one of its biggest flaws: the guitar doesn't stand up straight. The lower fin underneath the LTD fixed bridge makes the guitar fall onto its right-hand side, and considering you might find yourself in situations where there isn't a guitar stand anywhere to be seen, this will inevitably end up in knocks, dings and breakages, unless you prop it up very carefully against a nearby wall. It's a shame, because in many ways, the unconventional shape could very well be a contributing factor in this axe costing a fair amount more than what it probably should. 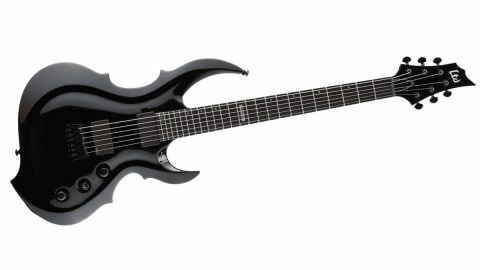 On the plus side, the FRX-401 does boast some incredible cutaways that allow you to widdle all the way up to the 24th fret with your eyes firmly closed - for shred-happy metallers looking to stand out, this in itself could be a reason to invest. Again, the EMG pickup set brings all the juice you need for a high-gain bonfire, this particular model favouring the cleaner and Metallica-approved EMG 60 in the neck, rather than the slightly muddier, Zakk Wylde-favoured EMG 85, giving it a little extra tonal mileage.